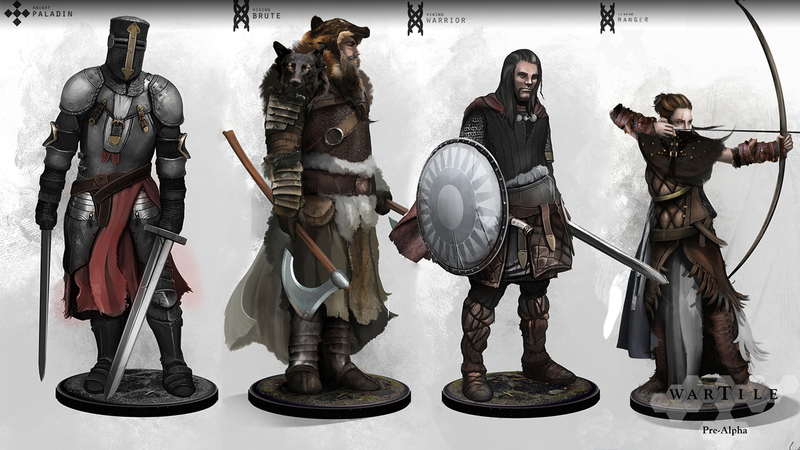 Wartile has just arrived on the kickstarter scene, and it has us a little excited! As our regular readers and listeners know, the GlitchFreeGaming crew all love board games and videos games equally (though some are more equal than others!). Wartile tries to blur the borders between the two mediums. It is a video game with a table top feel. I’m not talking about a video game adaptation of a board game, but a video game that has been designed from the ground up to play and feel like a board game. The game is half way between a real time strategy and turn based system. There are no turns or timers, but a cooldown system does control the speed of the game. 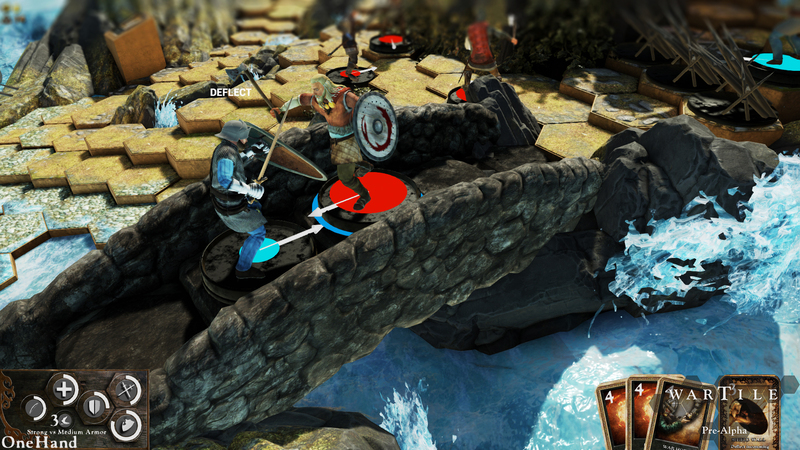 Units will auto attack when placed on a tile next to an opponent, but it is the placing mechanic that makes Wartile feel like a board game. In the pre-alpha build there are only a couple of “levels” to play. 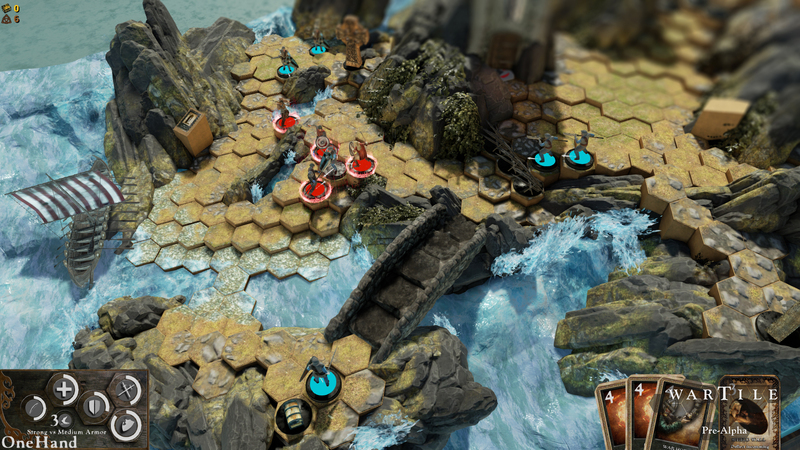 Wartile refers to these as “Battle boards,” and they are beautiful dioramas with hex based tiles that show the playable area. The boards are really visually appealing, and on to them you place your units. To move your units around you don’t click on them and then a destination tile like you might be used to in a game like this, but instead click and drag them, as if you had picked the unit up with your mouse, and then drop it where you want it to go. Each unit has different characteristics, including movement range, so when you try to drag the unit further than it can move in one turn it will stay hovering over the furthest possible tile in the direction you have dragged. To add further to the board game feel there is a deck of cards that you take into battle with you too. As you defeat units or capture strategic points on the Battle board you gain battle points, which you then spend in order to play cards from your deck. In the pre-alpha these cards had abilities such as healing a unit, applying a buff to units in an area, or striking an enemy down with lightning. Each unit type will also have a special ability card that you can play during battle. In the pre-alpha you play the first couple of missions from a Viking campaign, thus all your units are Viking themed. You start with a warrior and through looting chests in the missions unlock a spearman and a brute. The campaign has you invading England, so your opponents come in the form of men-at-arms, knights and archers. As you play through the campaign you will unlock upgrades for your figurines that can be applied in between battles from the main menu, which is represented as a table top. All the figurines that you collect sit here waiting to be taken into battle. 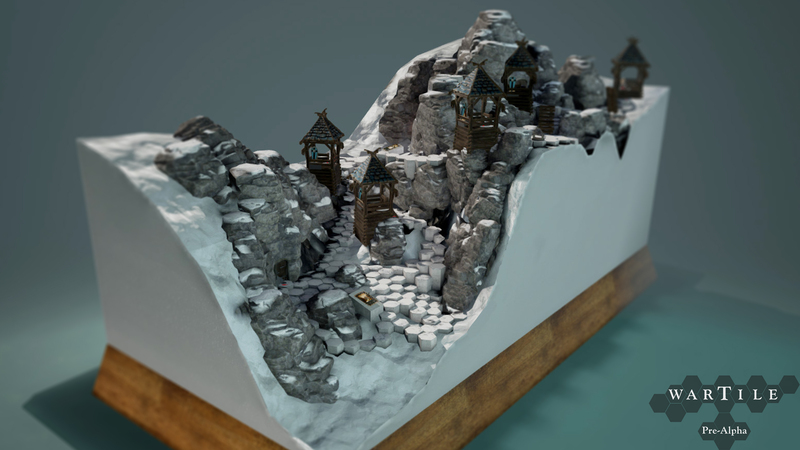 Wartile has just been launched onto kickstarter, where they are hoping to raise £55,000. There are an impressive array of pledge tiers, and getting the game will cost as little as a £5 pledge. Further tiers can snag you other goodies, including 3D printed models of some of the figurines. Unfortunately none of the tiers gets you a physical Battle board. If they did, that would be the tier I would be backing as those things just look gorgeous. Playwood Project, the team behind Wartile, were founded in 2014 by Michael Rud Jakobsen who has a host of design experience working on titles such as the upcoming Hitman game and Kane & Lynch 2. He’s joined by programmer Jens-Emil V. Kristensen and several experienced freelance developers. Sound design and composition is by Simon Holm who also worked on several Hitman titles as well as Kane & Lynch 2 and Heroes & Generals. Check out some of our Pre-alpha gameplay footage below, and don’t forget to head over to the kickstarter page for more information.